I believe leaders are a product of their environment. Plenty of people could be born leaders, but are reduced to another role by their circumstances. I think that’s why I like disaster movies so much: everyone starts acting exactly as their character dictates, not as the role they think they should occupy. People who wouldn’t normally be considered leader-like step up in situations like this, and the best leaders do it without anyone realizing they have taken control of the situation; they allow everyone to believe that each team member had a hand in the leading, and that they all share the positive results. Lao Tzu is SO in right now, guys. Why is it life can’t be scripted? Cog, my friend, thank you for sharing such a thoughtful response to the question. I both laughed and commiserated with you in equal parts. It is a thorny idea. While I’m still sorting through my own answer, I particularly liked your point that “desire” may be the ultimate differentiator for thought leaders. Desire is not a trait that can be taught, any more than I can teach my four year old that it’s not a good idea to scream loudly in a restaurant. Despite that, I have seen folks with the requisite skills suddenly blossom into the leaders they were always meant to be. It’s not often and it’s highly unpredictable….but it happens. Why? Lightning bolt of enlightenment? Great day at the gym? Hugs? No. At heart, it seems to be about a moment of self discovery. But can a PR practioner help that moment to occur? I think that we can, just a wee bit. Do you? Thank you for the question. It was truly enjoyable turning that one around in my head for a few days, and changing my own mind a few times along the way. By the way – please let me know if you figure out that screaming in a restaurant thing. Can a PR practitioner help that moment of “self discovery” happen — without thinking about it for days and writing a few thousand words on the topic I’ll bet on red and say most definitely. For the potential or reluctant leader, through the right encouragement or ego stroking (e.g. providing a platform through article or commentary placements where they can demonstrate their knowledge or (wait for it) expertise in their field; putting them in contact with the right journalists for citation as an authority in their field; etc) we can provide a gentle push towards the client recognizing their own value in their chosen field, or at the very least arrange it so that others in the field recognize the client’s value, which should in turn allow the client to appreciate what they can do for their field. At which point I would hope they’d step up and move forward. That being said, I’m not sure someone who doesn’t already have a hint of that chutzpah to begin with would seek out PR. It may be a matter of drawing a CEO (or other exec) out of his/her shell to be the company face and promote them rather the company as a whole to get them to phase if you could get them to walk in the door. Ah, yes. The famous “hint of chutzpah.” Certainly a key ingredient for a thought leader. 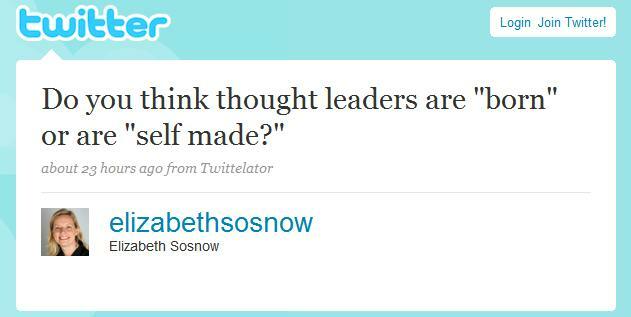 In fact, I’m hard pressed to think of a really successful thought leader who doesn’t have at least have a small dose. When we start working with someone who hasn’t developed thought leadership or marketing content before, we often tell them to develop ideas that follow the 4P’s: create Prescriptive or Predictive or Provocative but ultimately Prudent ideas. In short, we start teaching them about how to develop ideas with chutzpah. The hope, of course, is that successful bold ideas will begin to breed comfort and perhaps help to shape a new thought leader. In the era of social media, that matters even more due to new opportunities. And you know what? Clients seem to be embracing the change. Maybe thought leadership is finally ready to gain broader acceptance? Previous Previous post: Sorry for the delay….